American Airlines' New $1.3 Billion Terminal at John F. Kennedy International Airport Provides First Point of Contact for Tourist Appreciation Campaign, Which Includes Tips and Thanks from New Yorkers like Robert DeNiro and Julianne Moore. 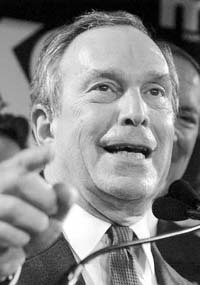 Mayor Michael R. Bloomberg today (Aug. 29, 2007) launched the first phase of "Just Ask The Locals," the City's first-ever five-borough marketing and advertising campaign to make visitors feel more welcome, thank them for visiting, and help them navigate New York City. The campaign, which starts today, includes outdoor advertising throughout the five boroughs, insider tips from celebrity residents available on a tourist hotline, and a new tourism website. Other elements include color maps that provide guided tours of celebrity residents' favorite neighborhoods and tip cards with the ten essential things to know when navigating the City, which will be distributed in hotels and by teams of tourism ambassadors on the streets. The Mayor announced the campaign at the unveiling of the state-of-the-art, $1.3 billion American Airlines terminal at John F. Kennedy International Airport. The terminal itself will serve as a campaign focal point, with advertisements for "Just Ask The Locals" lining the corridors to create a comprehensive welcoming experience for passengers. The Mayor was joined by American Airlines Chairman and CEO Gerard J. Arpey, Port Authority of New York and New Jersey Chairman Anthony R. Coscia, Port Authority Executive Director Anthony E. Shorris, NYC & Company Board Chairman Jonathan Tisch and NYC & Company CEO George A. Fertitta. "New York City truly is the world's second home, which is why so many people from across the globe make this a destination for their vacations and holidays," said Mayor Bloomberg. "New Yorkers have always been welcoming and friendly, but not enough people around the world know it. So now we're going the extra mile to make visitors feel even more at home by offering a helpful piece of advice, an insider's tip, or just a friendly smile as they explore and enjoy all the wonderful attractions here in our City. This new and engaging welcome campaign will help us continue to grow the tourism industry, even as the rest of the country has experienced a decline in international tourism." "We're excited to be joining NYC & Company in the 'Just Ask The Locals' campaign," said Gerard Arpey, Chairman and CEO of American Airlines. "The timing is perfect, given the completion of our new JFK terminal, one of the premier international arrival and departure facilities in the world. We're giving visitors to New York City a great first impression with our state-of-the-art facility, which includes 1.58 million square feet, two new Admirals Clubs and a Flagship Lounge. From our speedier security and customs processing to the New York City-themed art on the walls, our new terminal is producing a more convenient, welcoming and enjoyable travel experience for visitors and New Yorkers alike." At more than 1.58 million square feet, the new JFK terminal offers the travel industry's premier international arrival and departure facilities. The terminal includes 84 ticketing positions, 44 self-service check-in machines with both domestic and international check-in capabilities, security checkpoints capable of handling 1,800 travelers per hour, a new U.S. Customs and Immigration facility that can handle 1,600 travelers per hour, as well as a state-of-the-art, in-line security baggage system to expedite passenger processing times. "The completion of this terminal represents more than just concrete, bricks and steel," said New York Congressman Gregory Meeks. "It symbolizes the strength of character of the people at American Airlines who have sacrificed much under extraordinary circumstances for this project—the largest private investment ever in southeast Queens. New York City made a great choice in launching their tourism campaign in this awesome terminal and all it represents." "The United States, according to international surveys, has the world's worst entry process and that has very serious consequences for our economic as well as national security," said Jonathan Tisch, Chairman of NYC & Company. "The new American Airlines terminal and New York City's 'Just Ask The Locals' campaign, are at the forefront of making the entry process more welcoming and will quickly become the model that others will want to emulate." "From the moment they step off the plane, this innovative campaign will welcome our visitors in true New York fashion, and thank them for the important role they play in our city," said NYC & Company CEO George Fertitta. "While visitation numbers across the U.S. have unfortunately declined, 'Just Ask The Locals' is another example of how we can combat the national trend. By providing visitors with helpful tips and advice from real New Yorkers throughout their stay, we are clearly demonstrating that New York City is open, welcoming, easy to navigate, and will remain the preferred overseas travel destination in the United States." NYC & Company, the City's marketing and tourism arm, recruited hotels, celebrity residents, the Port Authority of New York and New Jersey and American Airlines to participate in this groundbreaking initiative. Along with the advertising firm BBH, NYC & Company collaboratively developed the creative advertisements and other elements promoting tourist appreciation. Among the celebrity locals featured are the actors Robert DeNiro and Julianne Moore, Today show co-host and former New York Giants running back Tiki Barber, the actor and comedian Jimmy Fallon and celebrated artist Chuck Close. 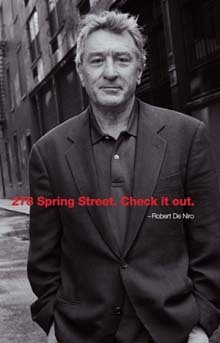 Each celebrity resident offers insight based on his or her personal experience: DeNiro, for example, is photographed on the streets of Tribeca, home to the renowned Tribeca Film Festival he founded in 2001. He tells visitors: "The best way to see downtown? Walk." To kickoff the campaign, a 50-member street team will distribute the tip card today to visitors on the streets of the City. The team will also assist visitors by providing directions and helping answer general questions. The street teams will wear specially designed "Just Ask The Locals" buttons – which list individual neighborhoods across the five boroughs – that New Yorkers can pick up at the NYC & Company visitor information center. An expanded list of recommendations will be featured in a special "Just Ask The Locals" section of NYC & Company's website, nycvisit.com. In addition, visitors will be able to hear advice from some of the celebrity locals by calling a phone information line that is available through 311. NYC & Company is also using a significant portion of its outdoor media assets to promote "Just Ask The Locals," including 150 bus-stop shelters citywide and 200 street-pole banners in Manhattan. The campaign includes a 30-second video offering helpful tips that will be seen in roughly 400 video-equipped taxi cabs. Tourism remains an important and vital industry in New York City. In 2006 alone, 43.8 million people visited the City, generating $24.7 billion in spending and supporting more than 368,000 jobs. Over the past several years New York City has also seen a steady increase in overseas travel. 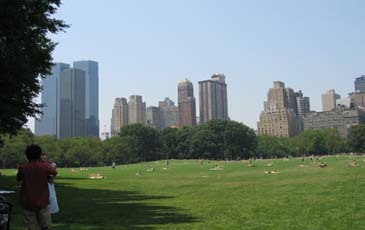 Between 2000 and 2006, overseas travel to New York City increased 9% - from 5.7 million to 6.2 million visitors. By comparison, overseas travel to the United States was down 17% during that same period. If tourism did not exist in New York City, the City would need to generate an average of $953 in additional state and local taxes from each household in order to maintain its current budget, according to a report by Global Insight. With a traveler capacity of 12.8 million passengers a year, the American Airlines terminal also will be a critical outlet for the campaign, having donated $4.5 million in advertising space to the campaign through the end of the year. Other recent improvements to the terminal include two new Admirals Club lounges and a new Flagship Lounge for international first class passengers, a combined $12 million investment. The new Flagship Lounge and a second new Admirals Club lounge are located in Concourse B and occupy a combined 18,200 square feet. Premium class travelers also benefit from new premium class check-in service, new premium class security lanes and new International curb-side check-in service – ensuring that curb-through-security processing takes less than 30 minutes.